The Sabres arrive home after an impressive four-game road swing along the west coast to an important game against a team they have struggled with for most of the season. 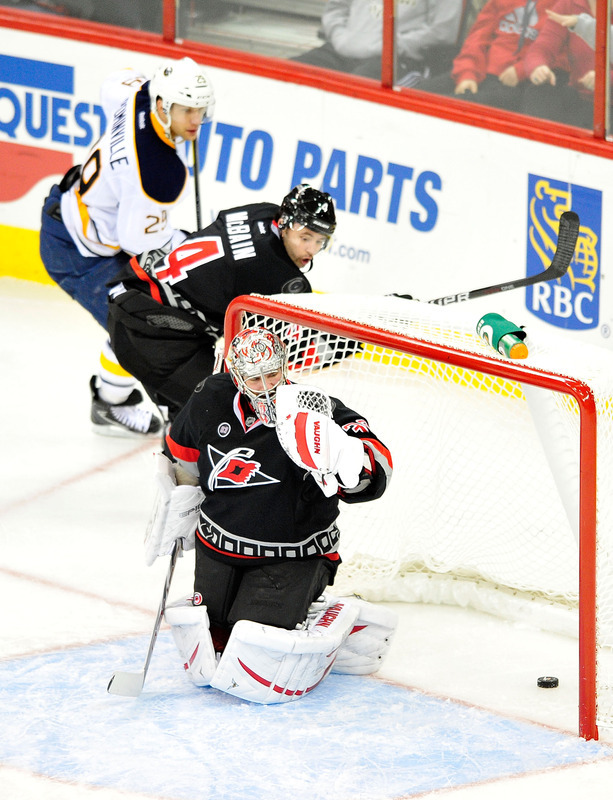 Carolina rolls into town with a 2-1-0 record against Buffalo this season and can play the role of spoiler tonight if they take two points from the Sabres. Buffalo could only enjoy one off day from their grueling western swing as they’re back with three games in four nights, beginning today. Lindy Ruff is faced with a couple tough decisions for tonight’s game. The first is which goaltender to start. The second is what to do with his stagnant top line. The goaltending question is rooted in two schools of thought. Do you roll your starter against the weaker opponent and the backup on the second night of the back-to-back set? Or you can roll out Jhonas Enroth against a team he owns while giving Miller the additional day off. My money is on choice number one. Based on the way Lindy Ruff operates, he will want to put his team in the best position to earn points. In my opinion, that is why he will roll out Miller against the Canes. That also keeps him away from a hostile atmosphere in Boston the next night. Is that the right choice? I say no. 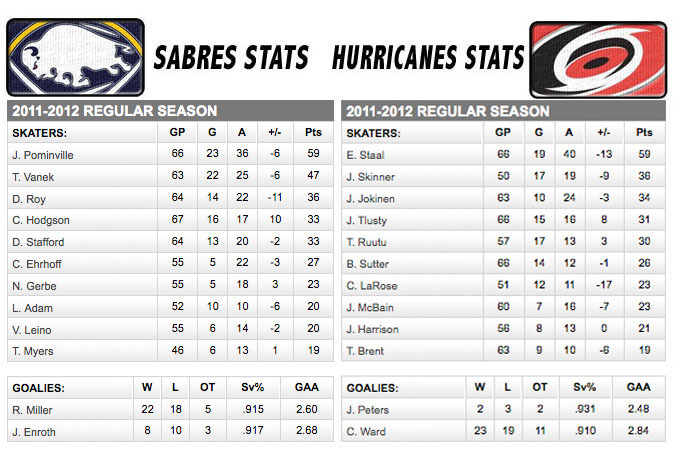 Enroth’s career numbers against Carolina are phenomenal, let him build on that history and shutdown the Canes. They’re a bottom feeder; don’t waste one of Miller’s starts on them. Not to mention, getting Miller an extra day of rest will do more for the long-term success of this unlikely playoff run. Plus, I don’t take too much stock in trying to keep Miller from a tough environment like the TD Garden will be on Thursday. He is mentally tough (most goalies are) enough not to be bothered with what the fans will be doing that day, it shouldn’t be too big of an issue. As for Ruff’s other tough task, he needs to find a solution to the scoring woes of his top line. It is a pretty simple concept. If they’re not playing well together, split them up. Buffalo needs a solid effort tonight. A quick start and sustained pressure should get the job done against Carolina. Vanek/Roy/Pominville. If these guys aren’t broken up prior to the morning skate, they will be the trip to watch. It is my opinion that Roy would be better served in a checking role with Nathan Gerbe and Pat Kaleta. Whether Ville Leino or Cody Hodgson is the best fit for the center role on this line is debatable. Regardless, I feel that Roy’s presence often brings down Vanek’s game and the virus seems to have spread to Pominville as well.